* * * DELICIOUS TECHNICOLOR FOOD. * * * * * AMARANTH! * * If our weobegone planet ever has a really dark day, inflation, endless war, plague, economic recession, outright depression, civil rioting, famine, food trucks being hijacked at city limits, you want a plant that gives easily grows in your yard and which gives you nutritious food --in abundance,-- without needing sprays. A plant which grows easily anywhere. That high protein grain Chet talks about is amaranth. Red when it's flowering, WHITE like any grain when threshed. IT tastes like popcorn or basmati rice and if you simmer up a pot, cooking it like rice, you will fill your belly with health and love the taste of it and have to shut your windows so your starving neighbors can't smell it's nutty fragrance. 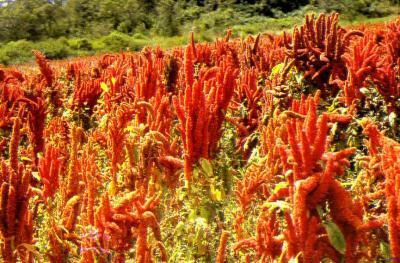 Pound for pound, amaranth gives you more actual cluck for the buck and grain for your space than any other popular grain that humans eat. It did wonderfully for the lady who posted this information below, and she's in New England, and it's great toasted or popped, and she says all her livestock loves it. Huge heads full of grain! She cooks it in casseroles, chucks the chickens the heads, don't bother to thresh them, they never need to be hulled. Great stuff. And the burgundy variety is really beautiful. The Mexicans pop it, then pour hard crack brown sugar syrup on it, with pepitas, nuts, and when it sets they sell it as candybars. Wrapped in plastic. You could make a living with AZTEC DULCE! As is so often the case, "new" is really just "old" rediscovered. You probably already know about two or three of the amaranths. more nutritious than those of most other grains. leaves, or for their grain, have been grown as summer "spinach,"
sometimes called tampala or Chinese spinach. directly outdoors about the same time you would sow beans or corn. You can start eating the leaves about a month after planting. flowers, and the largest yield of grain. qualities appeals to you the most. Try Bountiful Gardens (bountiful@zapcom.net) variety: Golden Giant amaranth; and Abundant Life Seeds (P.O.Box 772 Port Townsend WA 98368) Yeah! These guys are both cheaper than Seeds of Change and are both organic. Varieties: Burgundy amaranth, Mercado amaranth, and Popping amaranth. Each packet plants about a 20-foot row, so that's 80 feet of the delicious, nutritive food of the Brave Aztecs. Our POSTER is ANITA SANDS HERNANDEZ, Los Angeles Writer, Futurist and Astrologer. Catch up with her websites TRUTHS GOV WILL HIDE & NEVER TELL YOU, also The FUTURE, WHAT'S COMIN' AT YA! & HOW TO SURVIVE the COMING GREAT DEPRESSION, and Secrets of Nature, HOLISTIC, AFFORDABLE HEALING. Also HOW TO LIVE on A NICKLE, The FRUGAL PAGE. 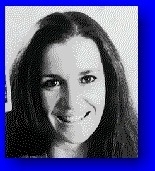 * Anita is at astrology@earthlink.net ). Get a 15$ natal horoscope "my money/future life" reading now + copy horoscope as a Gif file graphic! <=== GUERILLA CAPITALISM FOR YOU AND ME!